Now, cardboard recyclables will be collected separately from paper, plastics and metal recyclables. 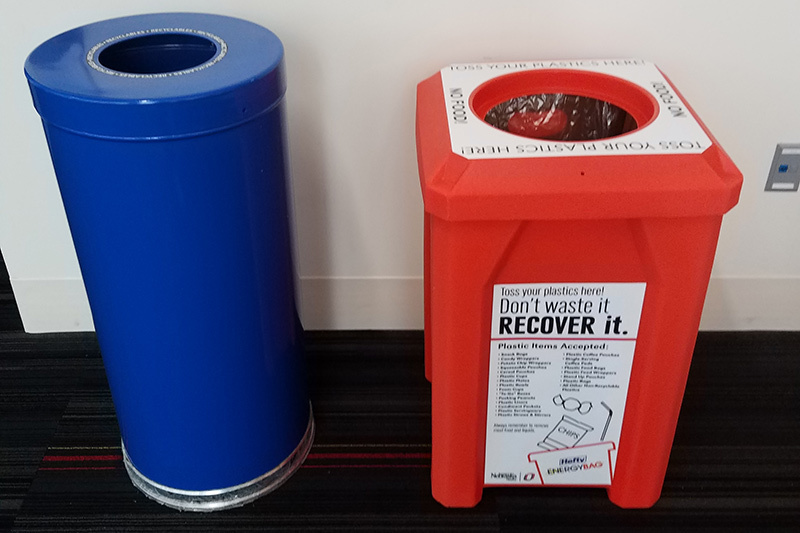 Starting on Wednesday, Aug. 1, UNO will implement changes to how recycling is collected on campus, requiring recyclable cardboard to be separated from other collected items. As part of these changes, UNO will now separate its cardboard recyclables into a dedicated container. All other recyclables, including paper, plastic and metal, will remain mixed in a single bin as they are collected. The changes are the result of modifications made by First Star Recycling, who manages UNO’s collection of recyclables. These changes do not impact UNO residence halls. While the majority of these changes will only affect those who collect and dispose of campus recyclables, UNO’s Office of Sustainability wants to make the entire campus community aware of these changes and provide tips on how you can help. If you plan to take your recyclables directly to the cardboard collection site or the mixed recycling compactor, you are encouraged to read the Standard Operating Procedure for Recycling to learn more about the new procedures. To ensure that UNO’s recycling is processed at the recycling center, and not refused and sent to the landfill, the university urges the entire campus community to adhere to these new guidelines. If you have any questions or would like to schedule a presentation for your staff on the new changes, please contact the Office of Sustainability, sustainability@unomaha.edu. What Can Be Recycled - And How? Cardboard will no longer be accepted as part of UNO’s mixed recycling collection and will be collected separately. When recyclables are moved to UNO’s mixed recycling compactor, all items must be loose. Recyclables collected together in plastic bags will no longer be accepted in the compactor EXCEPT in the cases of shredded paper and Hefty Energy Bags. What Can Be Recycled – And How? Please make sure all cardboard is dry and that all cardboard boxes are flattened. Items can be placed behind-or-near a recycling bin, or take to the nearest designated collection site for your building. Please do not attempt to shove cardboard boxes into recycling bins. If you have generated a large amount of cardboard, please contact Facilities Management and Planning to arrange for a pick-up. Submit a service request online using the “Maintenance Service Request” form. Recycling bins in public and centralized locations will remained lined with plastic bags for collection. Desk side bins will remain unlined. Only until the bags arrive at the mixed recycling compactor will they be opened and emptied into the compactor. If you are collecting your own recyclables, for example during a special event or office clean up; do not place multiple bags into one larger bag. This will make emptying the bags into the compactor easier for the staff. Hefty Energy Bag collections are located around campus in large orange containers and are used to collect “soft plastics” otherwise not covered by the other list of plastic items. For a complete list of items accepted and collection sites, visit UNO’s Materials, Waste, & Recycling page. Examples include: foam cups and containers; potato chip bags; candy wrappers; plastic utensils; packing peanuts; and condiment packets. All items should be collected at designated sites. The location of these sites have not changed under the new policy.